If you prefer to skip the video and go straight to the written instructions, see Add a signature to messages. Important: If you have a Microsoft Office 365 account, and you use Outlook and Outlook Web App, you need to create a signature in each. 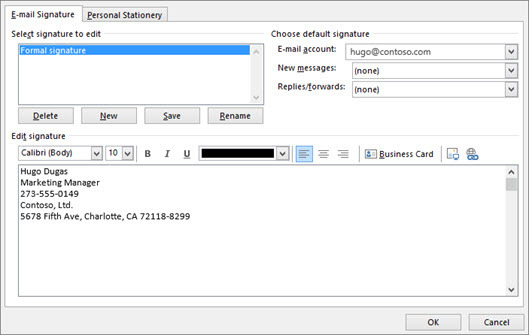 To create and use email signatures in Outlook Web App, see Create and add an email signature in Outlook Web App . In the Include group, select Signature, and then choose Signatures. 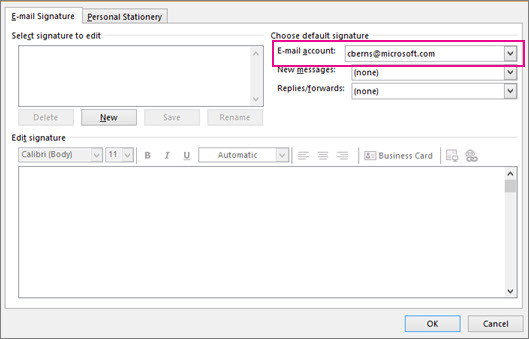 Under Choose default signature, in the E-mail account list, select an email account to associate with the signature. Under Select signature to edit, select New and type a name for the signature. Under Edit signature, type the signature that you want to use and select OK.
To learn more about creating and using signatures in Outlook, see Add a signature to messages, or the Using email signatures in Outlook training course.